For such as small country, Portugal certainly dazzles in its many forms and varieties. From the sun soaked beaches and plains of the south, to the mountainous regions in the centre and lush green hills of the north.The wonderful variety of countryside in Portugal is matched by the many charming towns and monumental cities throughout the land. From UNESCO heritage sites to border towns, dramatic hilltop settlements and sophisticated cities - all with their own unique Portuguese character and charrm. We at Secretplaces have spent many years travelling through Portugal in search of hotels, B&B’s and guesthouses that are truly authentic and have that something special. As diverse as this beautiful country is the choice of holiday accommodations on offer. We have put together a handpicked selection of the nicest. 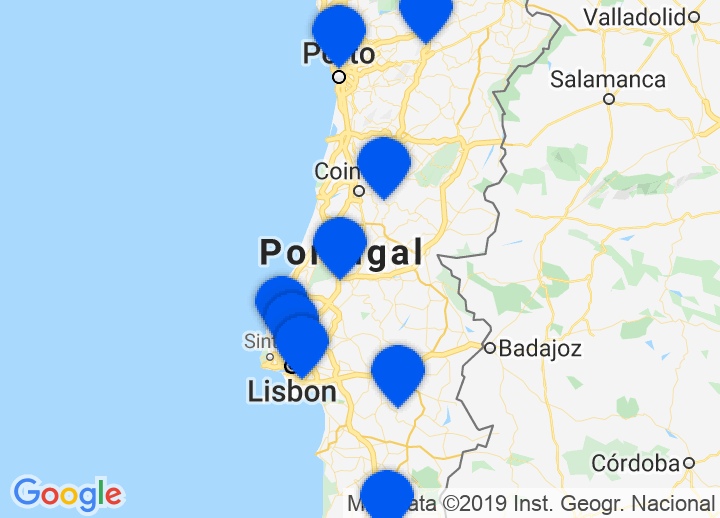 You can choose from boutique hotels in Lisbon, our seaside hotels in Cascais and the Lisbon coast or take a short break at one of our guesthouses or bed and breakfasts on the coast of the Alentejo, known as the Costa Vicentina. If you prefer wamer water a holiday in one of the charming Algarve hotels near the ocean sounds ideal. It is not easy to choose a destination in Portugal. The Algarve with its warm and turquoise water and sandy beaches surrounded by rocky cliffs comes to mind, then the trendy town of Lisbon with its boutique hotels and Oporto and its small guesthouses, which is so different to Lisbon. But it is the lesser known Alentejo with its fascinating and still untouched coast called Costa Vicentina with its country inns and seaside hotels that we especially recommend. Wine lovers will not want to miss the Douro valley with its traditional manor houses and wine estates from where you can also make a short break to see the Minho region and its coast in the North-East of Portugal. Famous Routes Whether your interest lies in Wine, Art, Architecture, Gastronomy, Literature, Nature or Religion there seems to be a route in Portugal that provides for every different taste and interest. Many have been well established for centuries and travelling on them will make their subject matter come vividly alive. Should you wish to know more about an individual route, please contact us. We will be happy to help you organise your itinerary and accommodation. Wine Country Succulent reds, cool whites, bubbly greens. Portugal produces an astonishing variety of quality wines given its size, many of them unknown to the outside world and grown in some of the country’s most beautiful regions. The fortified wines of Port and Madeira, however, are famous the world over and unique to Portugal. Mountains Portugal may not have the wealth of mountains that its neighbour possesses, but those it has are equally beautiful and wild. Natural Parks Portugal boasts a wonderful variety of natural parks and nature reserves preserving the natural beauty, wildlife, monuments and way of life of the regions. From the rugged, mountainous parks of the north, to the peaceful stress free reserves of the south, Portugal has much to offer the visitor when it comes to nature.